Planets Without Parents, Runnin' Wild : Blog Of The Nation A study in the latest issue of the journal Nature, has found there may be 10 Jupiter-sized planets floating around out there without a parent star. This makes my world feel even smaller. 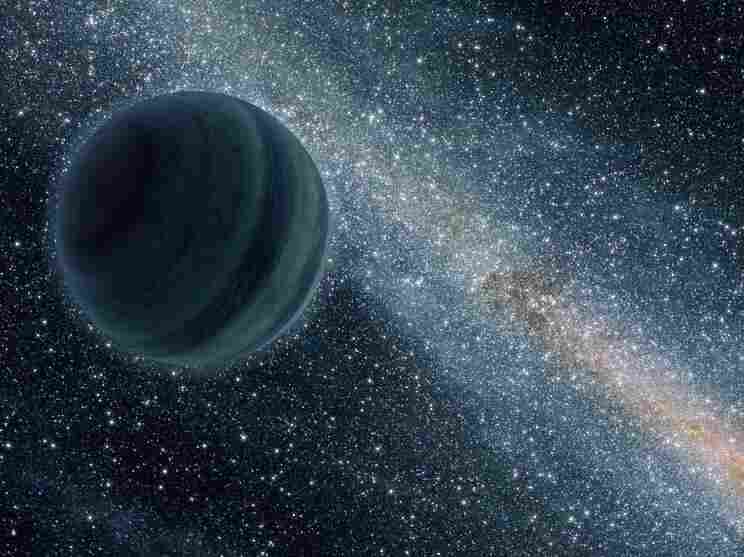 This artist's illustration of a Jupiter-like planet alone in the dark of space, floating freely without a parent star. Astronomers think there may be 10 such lone worlds. With Earth's population at 6 billion plus and counting, sometimes — if I'm having a bad day or if my problems seem so massive — I sit back and think that I'm such a miniscule speck in this world. Things zoom out even more when I consider that Earth is just one planet in the solar system, and then there's the galaxy. Now, there's news that there may be even more planets out there. A study in the latest issue of the journal Nature, has found there may be 10 Jupiter-sized planets floating around out there without a parent star. In other words, they have no sun to orbit. And it's not that these "homeless exoplanets" just don't have parent stars. Astronomers suspect that they were actually "booted" or "ejected" from developing solar systems. Sad. They must have really missed a curfew or something. I guess now they can stay out late and party in the dark.